A company meeting can have a reputation for being boring and unnecessary in the minds of employees; but they don’t have to be. By employing simple event industry practices meetings can feel less like a chore and more like a fun escape from a work environment. 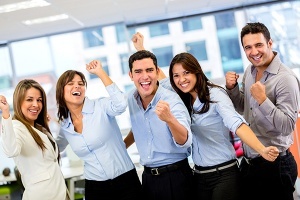 By encouraging fun and engagement, employees are more likely to be receptive to your overall message. Don’t be afraid to promote a company meeting in a fun manner. This can be done with humorous invitations and teaser videos to send out to employees. It is important to have an agenda laid out that grabs the attention of your employees while letting them know what is in store for the day. Some companies enjoy utilizing a theme to add value to the meeting. Perhaps the easiest way to change the mood of a meeting it to utilize funny videos and images as a kickoff to the event. By making attendees laugh, they are more likely to be engaged throughout the remainder of the meeting. Don’t be afraid to utilize “engagement games” to keep the crowd invested. Creating a reminder, such as a post-event video, can help ensure that attendees remember the experience and the value gained from attending.